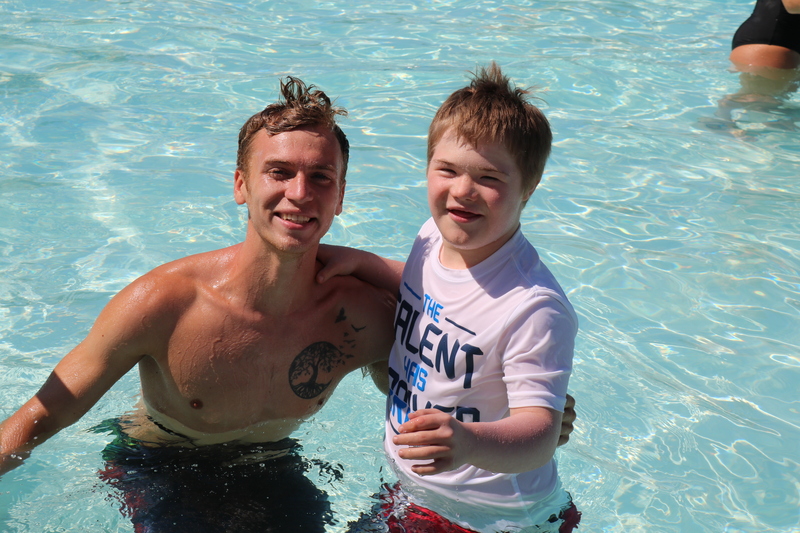 Participants have the opportunity to attend a camp program, supported by 1:1 or 1:2 professional staff while participating in games, crafts and activities as well as swimming, music therapy, horseback riding, circle time and snack. If you are interested in registering your child in this program, you will need to sign up for both the am and pm programs. We will have special entertainment and businesses from the community join us while we continue to participate in games and activities, as well as crafts and more swimming. This afternoon group will also venture into the community to enjoy some of the local attractions. If you are interested in registering your child in this program, you will need to sign up for both the am and pm programs. Aaron’s Acres Acts of Kindness (AAAOK) is a program in which our adolescents have the opportunity to continue our program in the afternoon and venture into the community to engage in age-appropriate service projects with their peers. Activities range from engaging with nursing home residents, to cleaning up local parks and trails, to lending help at homeless shelters. Our view is that when everyone participates, everyone benefits. A-Team is a program for adolescent ages 13-21 diagnosed with Asperger Syndrome. If you are interested in registering your child in this program, you will need to sign up for both the am and pm programs. The “A-Team” participates in age-appropriate recreational activities designed to develop their socialization and communication skills. Trips into the community could include the following: bowling, Greystone Therapeutic Riding Stables, or visiting the Lancaster Science Factory. In addition, these teenagers have the opportunity to participate in community service projects such as baking snacks for families who reside at the Ronald McDonald House in Hershey and then delivering them personally in order that they can gain a true understanding of what they provided to these people.